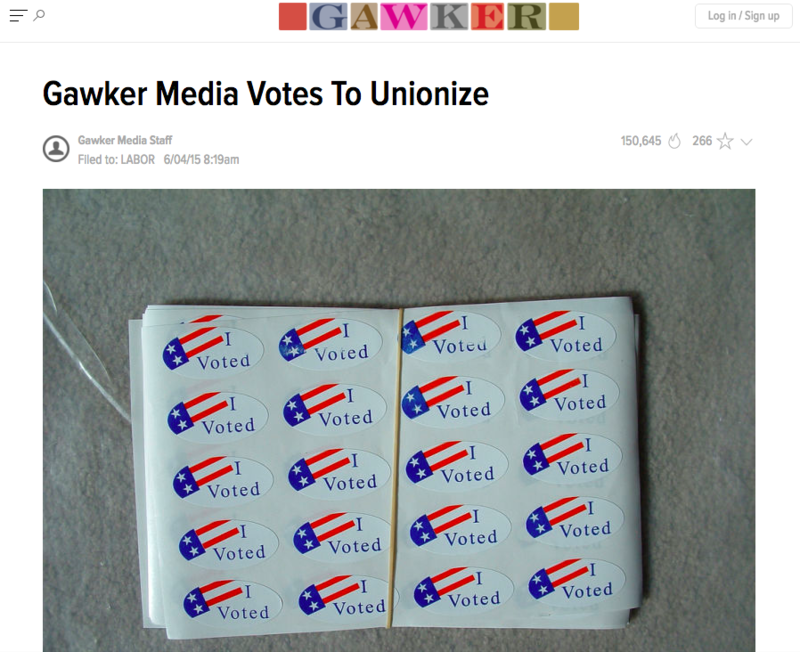 In June 2015, Gawker workers voted to unionize. Now, media workers worldwide are talking about how they can organize their own workplaces. Screenshot by J-Source. In early October, journalists, labour organizers, activists and academics converged in Louisville, KY, at the Media Workers Unite Founding Convention to discuss industry-wide campaigns to organize media workers. The convention, held at Nelligan Hall and the Carl Braden Memorial Center, drew about 30 people from the United States, Canada, Australia and Israel to discuss media workers’ rights. The convention was organized in the midst of an unprecedented wave of unionization among digital journalists in the U.S. Between June and September 2015, editorial employees at six digital media companies voted to join unions. After Gawker employees voted to join the Writers Guild of America East, others soon followed suit: Salon, Vice and ThinkProgress workers voted to unionize with the Writers Guild, and Guardian US and Al Jazeera America employees voted to become members of The NewsGuild, one of the largest media unions in the country. The unionization drive continues, as Huffington Post employees are currently organizing. Digital media workers have reportedly sought collective representation to secure ongoing legal protection and improve their working conditions so that they can continue creating high-quality and independent journalism. Last summer’s organizing wave also compelled non-unionized digital media workers to meet in Louisville to discuss how unionizing could improve working conditions at their companies. One convention participant, a digital journalist who asked to remain anonymous, echoed Peat’s comments, affirming that unionizing can give workers a voice. Some of the core issues discussed at the convention included overtime, byline and whistleblower protections, pay rates, new technology training, job security, health-care benefits, compensation for reusing journalists’ works, standardization of freelancer contracts and the ability to refuse to identify anonymous sources. Sara Steffens, secretary-treasurer of the Communications Workers of America, also mentioned an emerging concern: refusing restrictive “social media policies” that allow management to control journalists’ personal use of social media platforms and content they post even outside of working hours. Louisville was an ideal place to hold the convention and build an “alt-labour” movement for media workers, explained co-organizer and labour reporter Mike Elk. The city has a long-overlooked history of militant labour and civil rights activism, a legacy from which digital media workers today could learn, he said. During the 1950s, Carl and Anne Braden, two white Louisville Courier-Journal reporters, were at the centre of organizing social movement campaigns in the city. The paper eventually fired them for their activism. Convention presenter Cate Fosl, associate professor and director of the Anne Braden Institute for Social Justice Research at the University of Louisville, explained how the Bradens devoted their careers to civil rights organizing and used journalism to further their cause. Anne Braden also embraced anti-homophobia and social movement organizing as a local and community-wide effort. The Bradens ultimately used their overlapping axes of privilege—class, race and sexual orientation—to the benefit of oppressed groups, a lesson convention organizers hope journalists will take back to their communities. Today, the intersection between labour activism, class, race and gender is pronounced in advocacy campaigns to reform the media system in the United States. Joseph Torres, senior external affairs director of the lobbying organization Free Press and co-author of News for All the People: The Epic Story of Race and the American Media, highlighted the importance of “intersectionality” to reforming media structures. A long-term goal resulting from the Louisville Convention is eventually to build regional media worker centres across the United States. Elk envisions these centres as membership clubs and co-working spaces with a coffee shop and bar area that could bring media workers and organizers together offline to share resources. This post was originally published on J-Source and is republished here with permission. Errol Salamon is an associate member of CWA Canada and a PhD candidate in communication studies at McGill University. He’s co-editor and contributor to the forthcoming book Journalism in Crisis: Bridging Theory and Practice for Democratic Media Strategies in Canada (University of Toronto Press). His work has recently appeared on rabble.ca, J-Source, Montreal’s CKUT 90.3 FM and tripleC: Communication, Capitalism & Critique.